Negotiations over the UK’s departure from the EU are “now in the endgame”, Theresa May says. 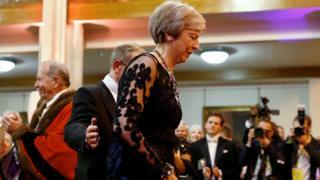 Addressing the Lord Mayor’s Banquet in the City of London, the prime minister said the talks were “immensely difficult”, but the sides were working “through the night” to make progress. “This will not be an agreement at any cost,” the PM added. BBC political editor Laura Kuenssberg said there was “huge frustration” in parts of the Conservative party and the cabinet about the PM’s approach. On Monday night, some cabinet ministers met for drinks in International Trade Secretary Liam Fox’s office to discuss Brexit, including no-deal plans and the sticking point of the Irish “backstop”. The prime minister is under pressure from both sides of the EU debate as she tries to seal a deal in time for Brexit in March. Why does Number 10 believe there could suddenly be a better answer to the same set of problems? As one former minister said, “two plus two is not suddenly going to equal five”. Some of them are even suggesting that the prime minister should consider walking away from the talks. One of them told me: “The raw truth is there is a gap between what we can accept and what the EU is offering. The unease centres on how the Irish backstop – a fallback arrangement to guarantee no new visible border checks – will work. And as well as Leave-supporting Conservative MPs who are worried about the UK being tied to EU rules, some pro-EU Tories also have misgivings. On Friday, Transport Minister Jo Johnson resigned, saying what was on offer fell “spectacularly short” of what had been promised and calling for another referendum. In her speech on Monday evening, Mrs May said: “The negotiations for our departure are now in the endgame. “And we are working extremely hard, through the night, to make progress on the remaining issues in the withdrawal agreement, which are significant. “Both sides want to reach an agreement. But what we are negotiating is immensely difficult. Mrs May said that “overwhelmingly” British people want the government to “get on with delivering Brexit”. “I want them to know that I will not compromise on what people voted for in the referendum,” she said. Jesse Norman has been promoted to replace Jo Johnson in the Department for Transport, Downing Street said. Mr Norman was previously a junior minister in the department.